The diagram shows the the life cycle of a frog. The chart illustrates the various stages of development in the life cycle of a frog. Overall, there are six distinct stages from egg to final maturation and mating. Initially, frog spawn (or eggs) floats on the surface of the water amidst the protection of underwater vegetation until tadpoles, baby frogs, emerge into the surrounding environment. The baby frog is tiny at this stage with only a head and tail to maneuver. Gradually, over time, the body enlarges while the tail gets longer and tiny legs appear at its base. With the appearance of legs in stage 3, the tail begins to shrink in size and the body becomes larger. By stage 4, the adolescent frog now has fully developed back legs and short front ones. Over time, the tail completely disappears and the fully mature frog leaves the water to begin its search for a mate. Once a mate is found, the two frogs breed, and the female lays more frog spawn in order for the life cycle to begin anew. State the beginning and outcome of the process. Describe what you can see. We can see some plants surrounding the frog spawn floating under the water. Usually eggs are laid here to anchor them and protect them from predators. We can use the time word “until” to demonstrate that something when it happens. Describe the frog in stage 2 to help describe contrasting changes in later stages. Describe all key changes to the frog. Explain the key feature of the plant. 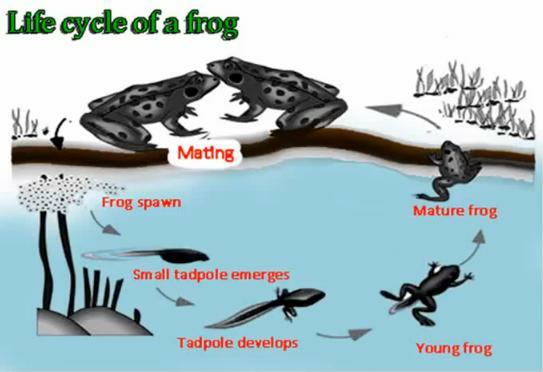 Chart illustrate the various stage of development in the life cycle of frog. Overall, there are six distinct stage from egg to final maturation and mating. Initially, frog spawn (or eggs) float on the surface of the water amidst protection of underwater vegetation until tadpole, baby frog, emerge into the surrounding environment. The baby frog is tiny at this stage only a head and tail to maneuver. Gradually, over time, the body enlarge while the tail gets longer and tiny leg appear at its base. With the appearance of legs in stage 3, the tail begins shrink in size and the body becomes larger. By stage 4, the adolescent frog now have fully development back legs and short front one. Over time, the tail completely disappear and the fully mature frog leave the water to begin its search for mate. Once a mate is found. The two frogs breed, and the female lays more frog spawn in order for the life cycle to begin anew. Begin can take either the infinitive or gerund form. Sentence fragments given in final sentence.